Media failed on climate and extreme weather coverage last year. Will they do better in 2018? Everyone knows that the U.S. got gobsmacked by hurricanes last year. But if you rely on mainstream media for your news, you might not know that climate change had anything to do with it. In 2017, the major broadcast TV news programs mentioned climate change only two times total during their coverage of the record-breaking hurricanes that made landfall in the U.S. The climate-hurricane link came up once on CBS, once on NBC, and not at all during ABC's coverage of the storms, Media Matters found. All in all, major TV news programs, radio news programs, and newspapers mentioned climate change in just 4 percent of their stories about last year’s big hurricanes, according to research by Public Citizen. Many major media outlets also neglected to weave climate change into their reporting on 2017's heat waves and wildfires. Will coverage in 2018 be any better? As we roll into summer -- the start of the season for hurricanes, wildfires, droughts, and heat waves -- that's just the kind of connect-the-dots reporting we need. The New York Times helped set the scene with its recent map-heavy feature on places in the U.S. that have been hit repeatedly by extreme weather. "Climate change is making some kinds of disasters more frequent," the piece explained, and "scientists also contend that climate change is expected to lead to stronger, wetter hurricanes." But it's one thing to report on how climate change worsens weather disasters in general, as the Times did in that piece. It's another thing to report on climate change while covering a specific storm or wildfire, as Roker did -- and many journalists still seem to be squeamish about it. They shouldn't be; science has their back. In addition to what we know about the general links between climate change and extreme weather, there's a growing area of climate research, called attribution science, that measures the extent to which climate change has made individual weather events more intense or destructive. Consider the research that's been done on Hurricane Harvey, which dumped more than 60 inches of rain on the Houston area this past August. Just four months after the storm, two groups of scientists published attribution studies about it: One study estimated that climate change made Harvey's rainfall 15 percent heavier than it would have been otherwise, while another offered a best estimate of 38 percent. Broadcast TV news programs did not report on this research when it came out, but they should have. And the next time a major hurricane looms or makes landfall, media outlets should make note of these and other studies that attribute hurricane intensity to climate change. Scientists can't make these types of attribution analyses in real time (at least not yet), but their research on past storms can help put current and future storms in context. Of course, in order to incorporate climate change into hurricane reporting, journalists have to be reporting on hurricanes in the first place. They failed miserably at this basic task when it came to Hurricane Maria and its devastation of Puerto Rico and the U.S. Virgin Islands. Maria got markedly less media coverage than hurricanes Harvey and Irma, according to analyses by FiveThirtyEight and researchers from the MIT Media Lab. The weekend after Maria made landfall, the five major Sunday morning political talk shows cumulatively spent less than a minute on the storm. 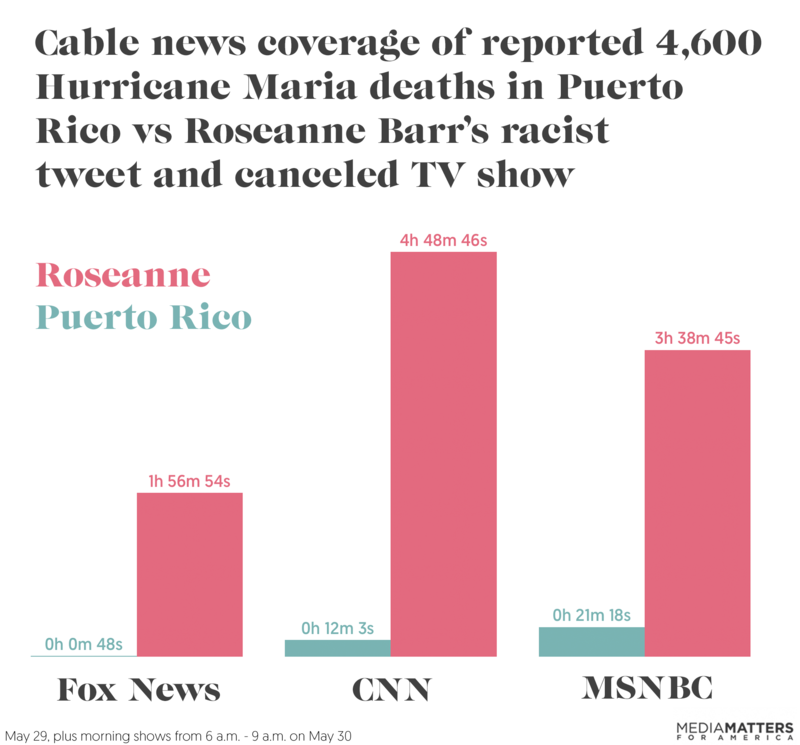 And just last week, when a major new study estimated that Maria led to approximately 5,000 deaths in Puerto Rico, as opposed to the government's official death count of 64, cable news gave 16 times more coverage to Roseanne Barr's racist tweet and her canceled TV show than to the study. Hurricane Maria overwhelmingly harmed people of color -- Puerto Rico's population is 99 percent Latino and the U.S. Virgin Islands' population is 98 percent Black or African-American -- so it's hard not to see race as a factor in the undercoverage of the storm. The authors of the MIT Media analysis attributed the lack of coverage to a “cultural gap” and suggested that more minorities working in media might have alleviated the problem. Not only are minorities less likely to be employed in newsrooms; they're also less likely to be included in media discussions of climate change. The lack of reporting on Maria sets a scary precedent, as climate disasters are expected to hurt minority and low-income communities more than whiter, wealthier ones. Unless mainstream media step up their game, the people hurt the most by climate change will be covered the least. Ultimately, we need the media to help all people understand that climate change is not some distant phenomenon that might affect their grandkids or people in faraway parts of the world. Only 45 percent of Americans believe climate change will pose a serious threat to them during their lifetimes, according to a recent Gallup poll. That means the majority of Americans still don't get it. When journalists report on the science that connects climate change to harsher storms and more extreme weather events, they help people understand climate change at a more visceral level. It's happening here, now, today, to all of us. That's the story that needs to be told.